CASABLANCA, – Since the beginning of protests in Morocco on Feb. 20 women have been at the vanguard. Many of the spokespersons of the protest movement have been women – observers and activists see this as a new phase of feminine emancipation in this North African country. “We have waited enough. Women now are out to say it is time for justice to be made,” Safaa Ferradi, a local activist, told IPS. In spite of the efforts made by the State and by civil society, women remain victims of violence and discrimination. The new family code in this country of 32 million people came into effect in 2004. It gave women the right to divorce, to marry without paternal permission, as well a right to alimony in the case of divorce. The new code did not give women equal inheritance rights. This culture is strengthened by other factors “like poverty and the ignorance of everyone’s rights and duties,” Taoufiki Belaid, a member of Amnesty International (AI), told IPS. 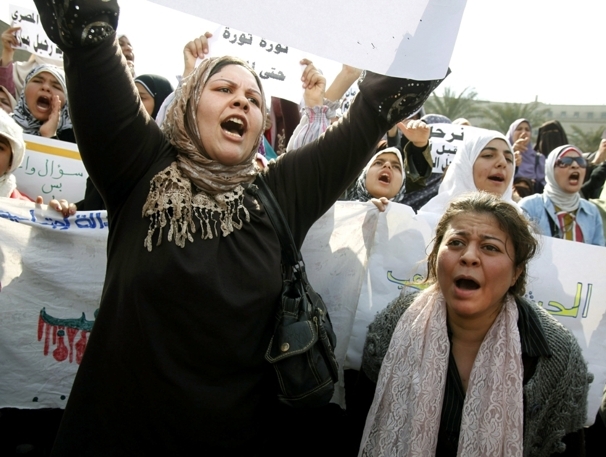 Women who are victims of violence, as well as their attackers, “ignore their rights and duties,” Belaid said. This does not mean that there are no actions being taken to increase awareness about women and their rights. Abderrahim Messoudi, who has been organising workshops about the issue in universities with a group belonging to the Moroccan Human Rights Association (AMDH), told IPS that the problem is the minimal participation of women themselves in such activities. Women’s indifference towards the actions of civil society is due, according to independent feminine activists, to the perception that these actions are biased. “There is no real civil society. Everybody tries to manipulate the feminine cause according to his own interests,” Ferradi said. In Morocco, unhappiness with political parties is not a new thing. Only 37 percent of the electorate participated in the last general election in September 2007. New electoral measures in Morocco call for women to occupy at least 30 of the 326 seats in parliament. But this does not satisfy Moroccan activists. “The parliament and the government will both stay mainly masculine,” Bouhraka said. According to a study by the High Planning Commission carried out in 2010, women represent only 25 percent of the working population. Women are also disproportionately illiterate – more than 50.8 percent of Moroccan women cannot read and write. Violence, economic and social discrimination have led women to the streets to protest under the colours of the Arab Spring. “Our demands are freedom, equality, and human dignity,” Ferradi said. “In our movement demands are equal for both women and men,” Nouami explained.